Pre-heat a plate for grilling, a cast-iron skillet medium fire. When, after throwing a few drops of water on the pan, these turn away like mercury, the pan is hot enough. Sprinkle with salt the plate for grilling and put the meat on it. Don't touch the steak and wait until the edge of the steak, starting from the bottom, has become grey (about 5 minutes). Meanwhile dip a cutting board in very hot water (I pour boiling water into the closed sink). Flip the steak using meat tongs (don't pierce the beef) and wait until the color grey is all over the edge (about 4 minutes; anyway about 1 minute less than the first time). Flip the beef again and wait about ½ minute for side to brown all the meat. Dry the cutting board (still warm) with kitchen paper. Turn off the heat and quickly wrap the meat in aluminium foil. Lay the wrapped meat over the cutting board and wait about 5 minutes; it still continues to cook. Remove the aluminium foil and slice into ½ inch thick. Set the slices over a serving tray. Season with salt, pepper and oil. 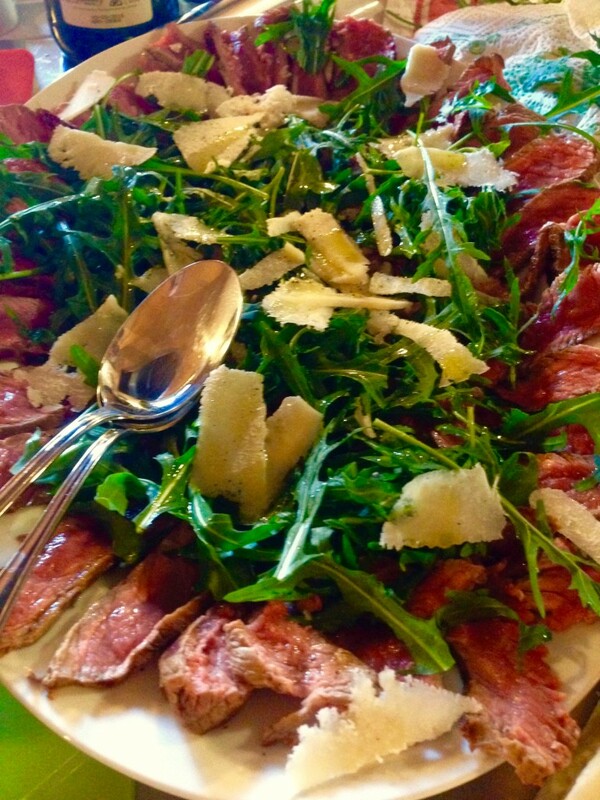 Put the arugula all over the meat and season again with salt, pepper and oil. Sprinkle with parmesan cut in slivers.